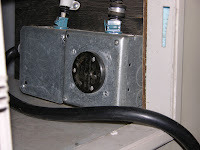 William, typically, to get the AC electricity produced by an on-board generator to power the RV, it requires one of two methods. The first is automatic; an automatic transfer switch, (usually with a time delay), senses the presence of voltage produced by the generator and automatically energizes the panelboard distribution panel in the RV and prohibits further input from the shoreline cord. 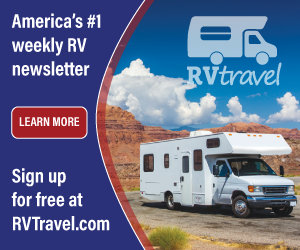 Motorhomes are wired so that two different sources of 120-volt AC electricity cannot feed the coach at the same time. The automatic transfer switch provides that methodology for both the hot and the neutral power conductors. The second process of getting generator power to the rest of the rig is by manually plugging the shoreline into a dedicated receptacle wired directly to the output of the generator. In other words, to get AC power to the RV you must plug the shoreline cord somewhere; either into an electrical source such as a campground pedestal, or into the generator receptacle. It’s usually located inside the same compartment as the shoreline cord. Pull the shoreline cord all the way out and look inside that compartment with a flashlight. I'm guessing you’ll see a 4-inch square box with a 30-amp female receptacle. Be sure all loads are turned off, then plug the shoreline cord into that receptacle and start the generator. If all the breakers are set properly, you should get power to the coach. Of course, you may have a problem with the transfer switch itself if your coach is so equipped. But that’s a whole ‘nuther issue! 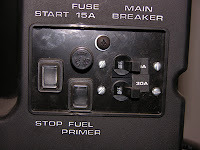 And depending on how old that motorhome is, there is a third method of obtaining generator power that mandates the user flip a set of circuit breakers. The older GMC motorhome had such a set-up at one time. The user had to manually flip the breakers from shore power to generator power. Also keep in mind all RV generators are protected by an integral set of circuit breakers located on the generator itself. It is possible everything in the motorhome is fine, but the breakers on the generator itself may be tripped. Look on the generator and be sure its integral breakers are in the on position.